The artwork on our Six Chief Parts greeting card is now available in an 8″ x 10″ print. Priced at only $10.00, this is the perfect gift for your pastor, those receiving first communion or confirmation, new members, or as a unique gift for your favorite Lutheran. 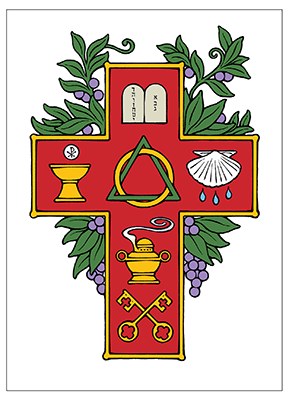 Description: Symbols for each of the six chief parts are arranged in a cruciform shape: tablets of the Law represent the Ten Commandments; chalice and host, the Lord’s Supper; scallop shell with three water drops, Holy Baptism; thurible with incense rising to heaven, the Lord’s Prayer; and crossed keys, the Office of the Keys. Central to all is a triangle interwoven with a circle, symbolizing the Holy Trinity confessed in the Apostle’s Creed. These symbols are charged on a red Latin cross pointing to Christ’s all-atoning sacrifice, which in turn gives life and produces fruit in the life of the Church and her saints. This entry was posted in Latest News and tagged EP Cards, Riojas, Six Chief Parts card. Bookmark the permalink.